This pleasant-looking plant may try to take your hand off if you’re not careful. 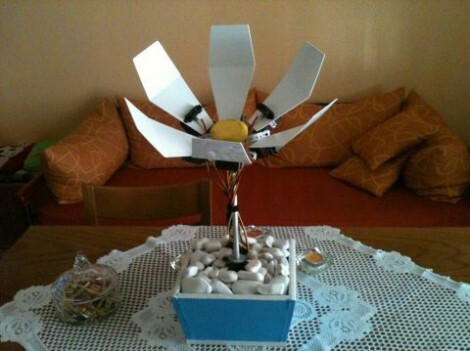 The robot flower (translated) includes sensors that cause the petals to move in reaction to external stimuli. You can just make out the distance sensors as black rectangles on two of the petals. These let the flower track an object by rotating the flower stem. But if they determine the object is getting a bit too close for comfort, the servo motor on the back of each petal will cause the flower to suddenly clamp shut. The video after the break starts off with an in-depth look at the hardware that went into the project. An Arduino clone called the GRoboduino makes this project a lot easier since it has a bunch of extras on the board aimed at things like sensors and servo motors. The mounting technique for the petal-powering-servos is quite attractive, and we enjoy the Snapple lid (probably not the actual brand but you get the picture) which has been coated with yellow felt for the center of the bloom. The final look is normal enough to fit in with home decor, but it still has enough geek in it to melt our hacker hearts. [Mikey] got a real deal on some A123 Pouch Cells. These are large Lithium cells that tolerate 100A discharge and 50A recharge currents, with 20 AH of life off of one charge. He’s been doing a bunch of testing to find out if the cells can go into an expandable battery pack and be made for use with hybrid cars. 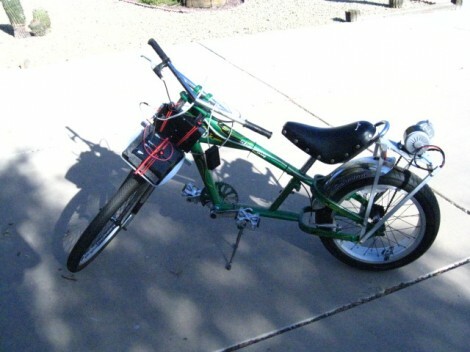 We just looked in on a battery tester used for solar power car arrays. This is a similar situation except [Mikey] is focusing on the test data, rather than the apparatus. The link above is a collection of his notes from testing. Start reading at the bottom of the page up to get the chronology right. He starts to zero in on the most efficient charging methods. Immediately he’s hit with a big need for cooling as the cells take no time to pass 100 degree Fahrenheit. 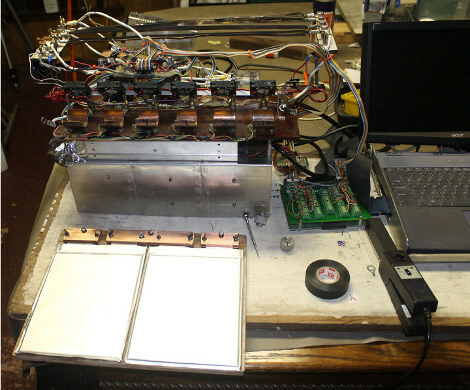 He continues testing with heat sink and fan, and even brings a thermal imaging camera to help with the design. Learning to lay out a printed circuit board takes some time. But after you’ve churned out a few it’s really pretty easy. If you find yourself at that point it may be time to learn about more complicated board fabrication. We think a good primer is this multi-layer PCB layout guide which [Rik te Winkel] recently put together. It’s one of the results of his internship experience. One of the major differences with boards that have more than two layers is the ability to alter what layers are actually connected by vias. Vias are plated holes through the substrate that connect different layers of copper. In the case of a 2-layer board these just go right through and connect the top to the bottom. But as you can see above, there are additional choices when it comes to multi-layer boards. #1 is a through via connecting all of the layers. #2 is a blind via; it stops part way through the board. 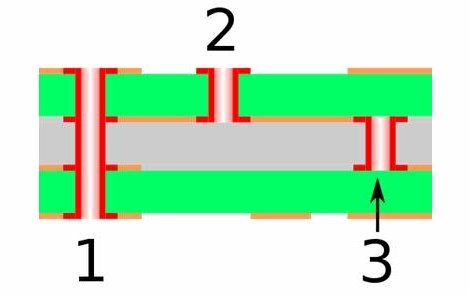 And #3 is a buried via; it connects internal layers but cannot be seen from either side. The guide is aimed at Eagle CAD. To use more than two layers you’ll have to purchase a license. But we think the concepts can easily be translated to other PCB layout software like Kicad. We’ve all had that sinking feeling as a piece of hardware stops responding and the nasty thought of “did I just brick this thing?” rockets to the front of our minds. 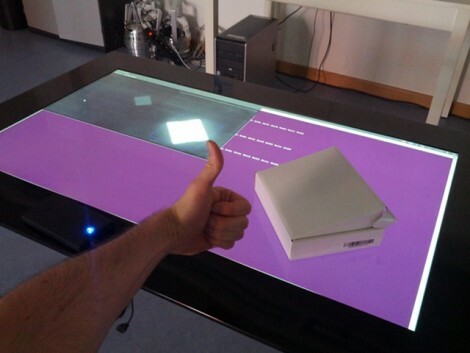 [Florian Echtler] recently experienced this in extremis as his hacking on the University of Munich’s Microsoft Surface 2.0 left it unresponsive. He says this is an 8,000 Euro piece of hardware, which translates to around $10,000! Obviously it was his top priority to get the thing working again. So what’s the first thing you should do if you get your hands on a piece of hardware like this? Try to run Linux on the thing, of course. And [Florian] managed to make that happen pretty easily (there’s a quick proof-of-concept video after the break). He took a Linux kernel drive written for a different purpose and altered it to interface with the MS Surface. After working out a few error message he packaged it and called to good. Some time later the department called him and asked if his Linux kernel work might have anything to do with the display being dead. Yikes. He dug into the driver and found that a bug may have caused the firmware on the USB interface chip to be overwritten. The big problem being that they don’t just distribute the image for this chip. So he ended up having to dump what was left from the EEPROM and rebuild the header byte by byte. It usually takes a bit of work to gain confidence when it comes to using new parts. [Glitch] got his hands on this OLED display which is manufactured by Sabernetics and wanted to give it a whirl before building a project around it. He grabbed his Bus Pirate to help learn the ins and outs of the new part. 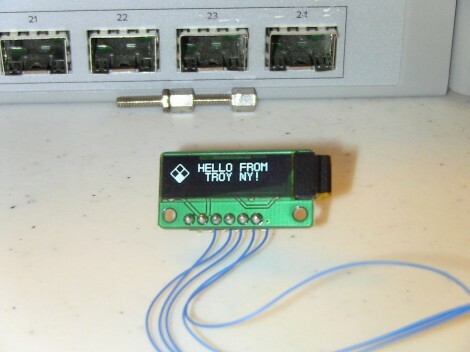 The 96×16 Dot-Matrix display uses the i2c protocol, keeping the pin count really low (six pins for: ground, reset, clock, data, chip select, and voltage). Since the Bus Pirate gives you command-line-like access to i2c it’s a natural choice for a first test. In fact, the tool has been our go-to device for that protocol for most projects. The first commands sent are configuration values for the SSD1306 that drives the display. These configure contrast, voltage conversion, and other important values necessary to power on the display. It sprung to life, showing random pixels since the RAM had not yet been initialized. With that success [Glitch] moved on to the Bus Pirate’s scripting capabilities and ended up with a Python script that drives the demo seen above. Now that he knows the commands he needs, it’ll be a lot easier to write code for a microcontroller driver. [Colin Bookman] lives in a Fraternity house and apparently the remote for the cable box has a way of walking off. He figured out a method to give everyone control of the TV channel in one form or another. 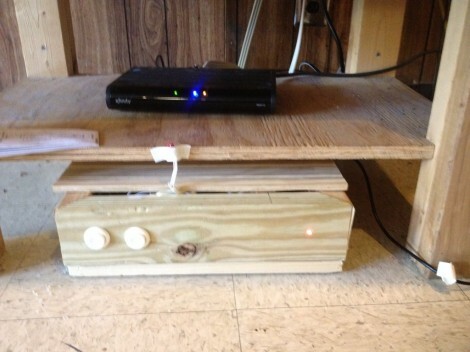 The cable box can be seen perched on that shelf, and [Colin’s] addition is the wooden box sitting on the floor. Inside is an Arduino board, and the cable snaking out of the enclosure is an IR LED. This give the Arduino the ability to send remote control commands to the TV box. The two arcade buttons on the front will switch the channel up or down. But this is hardly a remote control replacement since you have to get up to use it, so he went a few steps further. The Arduino board was paired with an Ethernet shield. It serves up a web page that has a virtual keypad. So anyone with a smart phone or laptop can log into the server and start changing the channels. We’re not sure if this provides relief from a missing remote, or promotes impromptu fist fights when brothers can’t agree on what to watch. It certainly opens up the possibility of long-distance trolling as you could be sitting in class and decide to change the channel to Lifetime every ten minutes or so. If you don’t have an Ethernet shield handy we’ve seen a similar setup that uses Bluetooth instead the network.